What will you be using the tent for? If it is for business, will there be a high footfall? How many people would you like to cover? Will they be standing or seated? 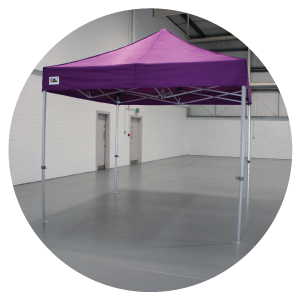 The Pro MX is a steel framed tent, with square legs and joints manufactured from hammer tested nylon. The Pro MX is ideal for private functions and occasional commercial use where footfall will be light. This is our lowest priced pop-up tent, and it comes with a twelve month guarantee. The Pro 40 is our mid-range tent, with 40mm hexagonal legs and aluminium framework. The joints and fixings are a combination of profile aluminium and hammer tested nylon, and the peak pole has an external spring which acts as suspension against windy conditions. It is perfect for regular or occasional commercial use, and is our most lightweight pop-up tent. This frame comes with a three year warranty. Often imitated, never bettered, the Pro 50 is the strongest tent of its kind on the market. With 50mm hexagonal legs and aluminium framework, including full profile aluminium joints and fixings, the Pro 50 is perfect for regular commercial use or in areas where footfall will be heavy. It comes complete with external peak pole spring to enable the tent to withstand higher than usual winds. This frame comes with a five year warranty. 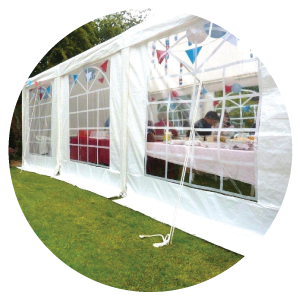 Our original Gala Tent marquee, the 240gsm Polyethylene covers are flexible, durable and strong, not to mention very highly water resistant. Ideal for both private functions and commercial use, the PE original Gala Tent marquee is the best value tent currently available on the market. Both the frame and covers come with a twelve month warranty. Often imitated, never bettered, the Elite PVC Gala Tent Marquees are the strongest and most durable tent currently available on the market. With 650gsm, self-cleaning PVC covers, this tent is perfect for commercial use, or private use where luxury and durability are the order of the day. Each panel connects to the next using heavy duty Velcro and dutch lacing, making this versatile tent the most popular on the UK market. The frame comes complete with a twelve month warranty and the covers have a three year warranty.